Pip Stitch: Time For A Few Links, Miri Finally Included! Time For A Few Links, Miri Finally Included! Time for a few free cross stitch and embroidery links. I found that link on a blog called le blog friendstitch. Go visit when you have some time for lots of links to cross stitch and embroidery freebies plus sewing tutorials. 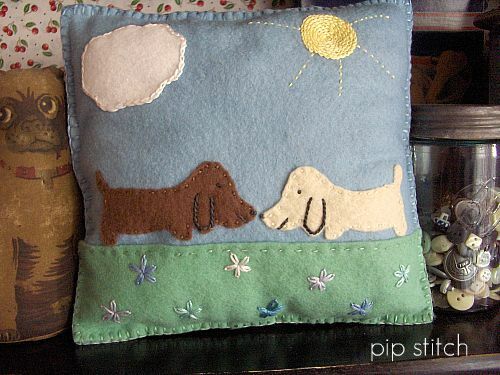 Have you been to the Liberty Primitives Needlework blog yet? Lots of really nice x-stitch free charts there. Check out the Saints 'N Stitches post at Waltzing Matilda for patterns to make embroidered Catholic saints dolls. Right now, the patterns are on Scribd and set to Private so you can't print them but Charlotte of Waltzing Matilda is working on fixing that. I have a thing for patron saints and would love to stitch up a few of these, especially St. Clare since she's the patron saint of needle workers and embroiderers. And television. There's a copy of a 13 page embroidery design catalog over at Maureen's Vintage Acquisitions Blog. Over at No Pattern Required are vintage embroidery patterns for a lamb. a bunny and an owl, two Scottie dogs, another bunny and another lamb and a kitten softie. I love that blog. So much vintage goodness. My friend Debra sent me a link to the freebie page at The Noble Wife. There are patterns for a quilt, an apron. a tote bag and cute embroidery designs. I've been meaning to link to the Sleeping Bunnies embroidery pattern for awhile (or maybe I did) and now I see that there a bunch of other cute free patterns on the Sew Charitable blog. Go see! They're all listed in the right sidebar. Back in September of last year, (Yes! September! ), Miri of Milk And Honey Quilts shared her Bonnet Girl With Umbrella pattern and I have been meaning to link to it ever since. (I always have great intentions. Just not the best follow through.) She had traced the pattern from a vintage quilt that she found on eBay and then used it to make blocks for her own quilt. How cool is that? And, in December, Miri finished her yo-yo quilt, which, I swear, I would go steal if I knew exactly where she lived. That's all for now. Have a great Thursday! Thanks for all the great links, Patty!